Bedford Blues’ building process for the 2016/17 season has continued with the signing of talented young prop Christian Judge and the re-signing of fans’ favourite and Dream Team fly-half Jake Sharp. Judge, 23, has signed on at Goldington Road from Plymouth Albion and he has been the standout prop in National One this season. Standing at 5ft 11ins tall and weighing in at 116kg, the prop had previously played for Launceston and had helped Cornwall to victory in the 2014/15 County Championship at Twickenham. Speaking about the capture of Judge, Blues director of rugby Mike Rayer said: “We’ve been keeping an eye on Christian for a little while now and it has to be said that he is an exceptional talent who has been a shining light at Plymouth and in National One this season. Preparing to ply his trade at Goldington Road for an eighth season will be fly-half Sharp. Still only 24, Sharp has been a consistent member of the Bedford squad and played a major role in the club reaching the British and Irish Cup final in 2011 as well as the Championship final in 2013. His control of the game has grown year-in year-out and he possesses a clinical kicking game that sets up numerous try scoring opportunities while also relieving pressure when needed. His performances this season have seen him nominated by opposition coaches as the best fly-half in the Championship. 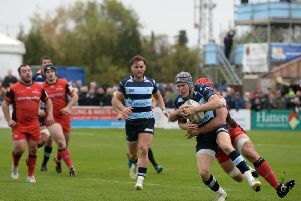 Speaking about Sharp, Rayer said: “Jake is, and has been for a long time, a key component of the Bedford Blues squad and he epitomises the brand of rugby that we like to play. Judge and Sharp join new signings Ben Adams, Ed Taylor, Tom James, Jacob Fields and Will Carrick-Smith for the 2016/17 season, along with Camilo Parilli-Ocampo, Jack Culverhouse, Dean Adamson, Michael Le Bourgeois, Mike Howard, Paul Tupai, Justin Blanchet, Pat Tapley, Ollie Dodge, Sam James, Josh Buggea and Jordan Burns who have all signed new deals, while Myles Dorrian heads into the second year of his contract. The Blues will be taking on Bristol in the first leg of the Greene King IPA Championship semi-final on Sunday afternoon (kick-off at 3.15pm). You can buy your tickets online at www.bedfordrugby.co.uk or visit Goldington Road between 9am and 6pm until Friday evening.